Over the past few weeks, Canadian Prime Minister Justin Trudeau has been struggling to contain the biggest political challenge of his tenure. Fallout from the so-called SNC-Lavalin affair has cost the prime minister two top ministers, Canada's top bureaucrat and his close friend and senior aide. His popularity has taken a sharp drop in the polls a few months ahead of a general election, scheduled for this autumn. And a number of the key protagonists involved say unanswered questions remain that need to be addressed and are keeping the heat on the prime minister. Here are five quotes that help explain the affair and what it means for Mr Trudeau. This quote cuts to the heart of the matter - that former attorney general and justice minister Jody Wilson-Raybould says she faced inappropriate political pressure related to the prosecution of a major Canadian engineering firm. It was her testimony on 27 February that made Mr Trudeau's political troubles go from a major headache to a full-blown political crisis for him and his federal Liberal party. Speaking to a parliamentary committee, she accused him and members of his inner circle of spending months trying to politically interfere by pushing for a legal favour for SNC-Lavalin that would allow it to avoid prosecution and instead face alternate penalties like a fine. She believes she was shuffled out of the justice portfolio for refusing to budge. She quit Mr Trudeau's cabinet on 12 February. In this quote, she is talking about the 10 phone calls and 10 meetings about the SNC-Lavalin matter that she says she or her staff had with either Mr Trudeau or people close to him, many of which she felt crossed the line of her prosecutorial discretion as attorney general and raised partisan concerns. Pollster David Coletto said it was right after her bombshell testimony that Mr Trudeau's popularity took its sharpest drop with the Canadian public. Opinion surveys by Abacus Data indicate that positive impressions of the prime minister have declined over 10 points since December. SNC-Lavalin is one of the world's largest engineering and construction companies. It's facing fraud and corruption charges in relation to millions of dollars in bribes it is alleged to have offered to Libyan officials between 2001 and 2011, when Muammar Gaddafi was in power. A conviction could result in a decade-long ban on bidding on Canadian federal contracts. SNC-Lavalin has openly lobbied to be allowed to enter into a remediation agreement instead of going to trial, saying it has cleaned house, is under new leadership, and changed its ways. Mr Trudeau's former principal secretary Gerald Butts gave a very different version of events regarding any conversations had between the prime minister's office and Ms Wilson-Raybould's. Like the prime minister, he denied any wrongdoing and said that any discussions were within the rules. He told the committee that: "People can come away from the same experience with different impressions." 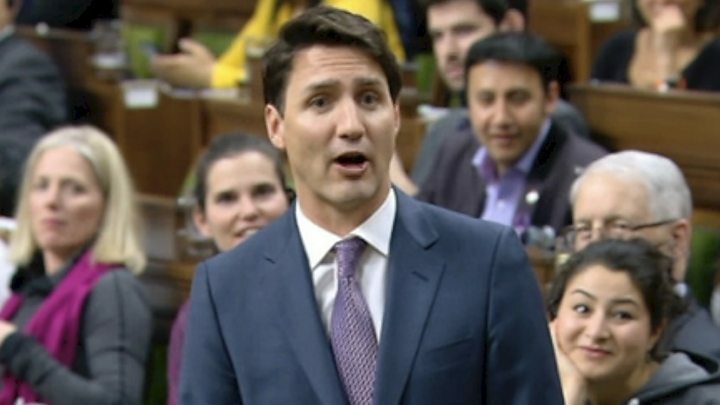 And like the prime minister, he maintained that the government was preoccupied by the economic ramifications - specifically the risk to the firm's roughly 9,000 employees in Canada - if SNC-Lavalin was to head to trial. Since then, that narrative has been called into question. ReNew Canada, which covers public infrastructure in the country, says that while a conviction would hit the firm's bottom line, there's no clear indication those jobs would disappear from the Canadian marketplace. In a series of interviews this week, SNC-Lavalin's CEO warned that there could be some risk to jobs though gave no clear figures. Penny Collenette, with the University of Ottawa's law faculty and a former Liberal senior political aide, told the BBC the job loss defence by the prime minister is "one piece of evidence that's troubling people". She added: "We seem to lack evidence about whether or not these 9,000 jobs are really going to be lost. We don't know exactly where that narrative came from," she said. Canada's top public servant announced this week he will step down before the next election because he felt it was clear "that there is no path for me to have a relationship of mutual trust and respect" with opposition leaders. Clerk of the Privy Council Michael Wernick made two combative appearances before a parliamentary committee looking into the matter where he defended the government's actions. That including responding with the above quote when pressed on whether he could recall making comments to Ms Wilson-Raybould about SNC-Lavalin like "[Mr Trudeau] will find a way to get it done one way or another". (He did not recall the remark). It was the dual testimony by Mr Butts and Mr Wernick that has led to a current stand-off between the Liberals and opposition parties, who say they have not got to the bottom of what happened. "We've had this slow drip of a process where information has come out bit by bit by bit. And now we're into a time of 'they said-they said' back and forth that is producing more mud than it is clarity," University of Saskatchewan political historian Ken Coates told the BBC. "It's dragged on for a long time and I think it's really hurting the country in some very significant ways." Longstanding regional tensions in the country have been exacerbated by the ongoing crisis. In Western Canada, where the energy sector has been shedding jobs, the Liberal government's seeming keen focus on the economic future of Quebec-based company has been called "a slap in the face". 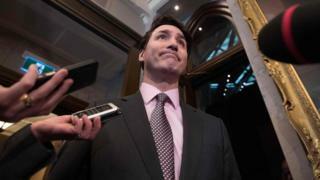 Indigenous Canadians, already growing frustrated with Mr Trudeau's reconciliation efforts, are concerned with the loss of two ministers who were seen to be " truly transforming the agenda" in government, said Mr Coates. This crisis has been damaging to Mr Trudeau's political image. The self-declared feminist prime minister won the last general election on a commitment to do politics differently, and a vow his brand of politics would be positive and transparent. Mr Coates summed it up as "a classic example of somebody being hoist on their own petard, basically". "It makes him look like the kind of politician he said he wasn't going to be." Opposition parties - who are smelling blood in the water a few months before Canadians are expected to go to the polls - are taking full advantage of a government in damage control. On Wednesday, Conservative members of Parliament accused the prime minister of being a "fake feminist" for "muzzling strong, principled women" like Ms Wilson-Raybould. The Trudeau Liberals some time to put the current political crisis behind them before the election - but has the prime minister's brand has been permanently tarnished? Mr Coletto says he will be watching to see if the current drop in popularity is "the new normal" for Mr Trudeau. He says there's a good chance the controversy won't be the issue Canadians vote but one that "colours their choice" in the ballot box. One of the reasons Mr Trudeau has had such a hard time putting this affair behind him is that the blows keep coming - a number from his very own team. The latest is an interview with former cabinet minister Jane Philpott in Maclean's magazine, published on Thursday. Earlier this month, she quit the cabinet on principle, saying she had lost confidence in the government over its handling of the matter. Ms Philpott told the news weekly that, while she has struggled with her decision and its ramifications for her Liberal colleagues, she believes both she and Ms Wilson-Raybould have further points about the matter that should be aired. "My sense is that Canadians would like to know the whole story," she said. "I believe we actually owe it to Canadians as politicians to ensure that they have the truth." Outside of Ms Wilson-Raybould's appearance before committee, both she and Ms Philpott have remained silent about the details of their concerns, saying they cannot breach cabinet confidences, which are privileged communications. Ms Wilson-Raybould was able to testify only when part of that privilege was waived by the government prior to her appearance before committee. The opposition parties continue to pressure the government and want it to extend that waiver to cover a longer timeline of events both women say are relevant to the matter. Mr Trudeau has shown no intention of doing so, saying he believes that his former attorney general has been able to fully air her concerns over four hours of testimony. But neither Ms Wilson-Raybould and Ms Philpott - who both remain Liberal MPs and say they support the party - show the same willingness to let the matter rest.